Adm Chan Chak "The Danish steer man was the first one shot, then the engineer. MacDougall and others were wounded. Most of the stray bullets had hit the boat and even some had hit my helmet. The boat was sinking and I ordered everyone to abandon ship. Hsu was very wary about me the “One Foot Admiral of 50” swimming such a far distance. But I assured him that I ’ll be all right. Hsu helped me take off my wooden leg along with the HK$40,000 (GBP£2,500) stuffed inside it. The Admiral, Henry Hsu, Coxswain Yeung Chuen, Maj Goring, David MacDougall and Ted Ross appear to have been the last to abandon the boat. Adm Chan Chak "When I was about to jump off the sinking torpedo boat Yeung Chuen stopped me. “Admiral, I can’t swim what should I do?” Yeung could not swim and he suggested that we should go back to Hong Kong. “Going back means surrender. I would rather die!” I said. "The British people did not understand what we were arguing about. The bullet removed from Admiral Chan Chak's wrist was 6.5mm as used by the Japanese "Type 96 Light machine-gun" with a range of six hundred yards. The injured Admiral shouted for the others to wait for him, but it was all in vain. The others were swimming for their lives towards the island with bullets hitting the water all around them. Waiting by the stricken boat Chan and Hsu could see the bullets dancing all-round the swimmers. Leaning over the gunwale with his leg in the water Chan began talking to SK, while Hsu prayed for a miracle to happen. Ted Ross had competed successfully at the Shanghai rowing club and had kept himself fit with sports activities in Hong Kong. David MacDougall MoI "So over the side we went. Owing to the wound in my back I couldn’t take any clothes or shoes off and I simply flopped in as I was. I swam first on my face and then, as I tired, on my back. I had no serious hope of gaining the island. Ted Ross MoI "For a moment the fire into the boat lessened somewhat as the Japs turned all their guns on the men swimming. I took a quick look over to see how far away the island was and the water was simply a maze of splashes where the bullets were pouring all around the swimmers. The water was just dancing with bullets. As the machine gun came round you could see all the bullets hitting the water, I could see these guys getting hit in the water. One man (Harley) was either wounded or he couldn't swim and was drowning noisily. Adm Chan Chak "Hsu helped me in the water; we were both trying very hard to reach the shores of Ap-Lei-Chou. Yee Siu-Kee and 2 other British soldiers had to remain on the boat. Yee could not swim and the 2 soldiers were badly wounded. It was winter time and the sea was cold. We were all sitting ducks in the water and non-stop bullets were flying everywhere. It was tremendously difficult to escape through the water. I ordered a stop movement command to the others. Because of the noise from the gunfire, no one had heard me. I was left alone by the boat with Hsu, and waited for 20 minutes. The shooting eventually eased off, and Hsu started to swim towards the island with Chan on his back. Eventually Chan told Hsu to swim ahead. Adm Chan Chak "We abandoned the boat and swam towards an Island one Li distant. The one Li distance seemed like the “Hell’s Gate” to us and the harsh conditions didn’t help either. The boat was riddled, with Damgaard shot through his legs while Sub-Lt Forster who had served on HMS Cornflower took a bullet in the stomach. Both were lying in the biles in agony. Harley the former 2nd Engineering officer on the 8,000 ton coastal freighter SS Yatshing was also shot and drowned after going overboard. Those that could, swam towards the uninhabited Aberdeen Island, so named by the Royal Navy as it lay at the entrance to Aberdeen, the larger island was already named Ap Lei Chau. Aberdeen Island was officially named Ap-Lei-Pai in 1957. The Admiral told Hsu to swim ahead as he felt he could swim unaided okay. It was a still evening, no wind and the water flat calm which made it easier for the swimmers to keep the abandoned boat between them and the gunners. Most fetched up on Aberdeen Island with a few, Maj Goring, Capt Macmillan & Supt Robinson fetching up on Ap Lei Chau. Maj Goring GOC3 BHQ "As for myself, it took me the best part of three-quarters of an hour to reach the Island. " Maj Goring GOC3 BHQ "For some time I floated aimlessly round like a jelly-fish, until a friendly wave picked me up and threw me on the shingle. Bullets spattered all around, flinging up the stones and splintering the rocks; but luckily nothing hit me. At length I crawled forward to a large rock and tried to take cover behind it. Adm Chan Chak ROC "I finally swam ashore on the small isle right next to Ap Lie Chau. After I swam ashore, I saw that Hsu Heng had already been there for a while. At that point, the enemy continued shooting at the Isle, the noise was just like dropping pearls. From time to time dropping a fire bomb, causing fire to the woods and grass on the isle, making the situation more desperate for us, fortunately we survived hiding in a cave near the shore. I then asked Hsu to report to the Central Government in case of any accidents, and to give my ring to my wife if I die. 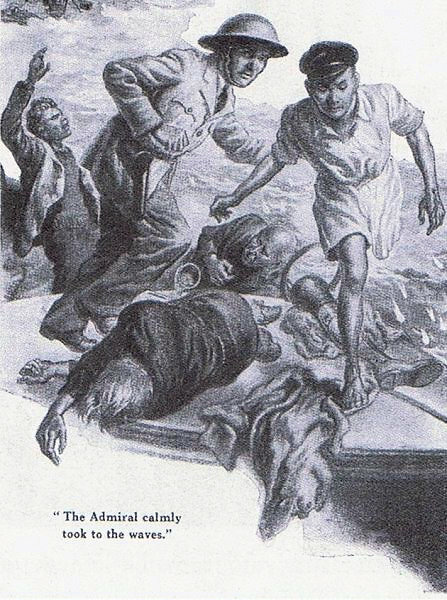 Henry and the Coxswain Yeung Chuen tried to carry the wounded Admiral up the slope, but found it impossible. They found a cleft in the hillside and put him there with Chan insisting on having a gun in the event the Japanese find him, in which case he would take his own life. Major Goring wrote his account eight years after the event and clearly gets confused about which island is which with Ap Lei Chau and Aberdeen Island, I have reversed his islands for this account. Capt Freddie Guest BHQ "By God, Bill, your right! There’s a boat down there and it isn’t a junk! Gandy ignored his orders, just like Commander Horatio Nelson had in 1797 during the battle of St Vincent, and carried on maintaining a watch on the Aberdeen harbour exits. As this signal was being decoded a small boat was seen approaching from the west, as somebody was spotted swimming out from Aberdeen Island. Christensen was hauled aboard 27, what he had actually said was “There are ten chaps following being machine-gunned” Fearing damage by rocks Parsons then reversed 27 smartly out as silhouette's were spotted coming over the hill in the eerie moonlight. The Officer of the watch on MTB 11 promptly opened fire as 10 came alongside with orders to go to Telegraph Bay. Capt Freddie Guest BHQ "We had chosen a good spot on the skyline to make sure they would see us. There wasn’t long to wait for an answer. In the eerie darkness they apparently mistook us for Japanese and with a mighty burst opened fire at us with a machine-gun! Lt-Cdr Gandy RN (Ret) (MTB 10) "I was informed that Admiral Chan Chak and party were hiding. SOE agent Colin McEwan embedded on board MTB 11 refered to shells hitting the sea as being like a door slamming shut. Colin McEwan SOE (MTB 11) "Soon after MTB 10 came alongside with the news that HK had surrendered and that we were off. During this parley, figures appeared on the skyline and Legge at once grabbed his Lewis and started in. Luckily, as it turned out afterwards, my Bren had no magazine and by the time it was fitted orders not to fire were given. Evidently they were friends, but as to their identity we were to remain in ignorance as we were ordered to Telegraph Bay to contact the other three boats. As fate would have it, this was the very time our engines would not start and only after towing did they roar into life. Finding a tombolo adjoining Ap Lei Chau, Oxford could see Christensen swimming out to a lone MTB as two more boats were proceedings away from the cove. Max quickly followed suit and was soon hauled on board by the crew. Sq-Ldr Max Oxford RAF "I lost touch with Guest and descended to the sea with the faint idea of putting out in the float – when I got to the water I saw, not far away and near the shore one M.T.B. with a man swimming towards it and two others a short way out. The Aberdeen Island party had to brave the water once again and swim out to the lone MTB which had now come to within one hundred and fifty yards of the shore. Lt Parsons and his crew hauled them on board one by one. The swimmers were in a various state of undress, Freddie Guest had only his shirt tails covering his modesty. 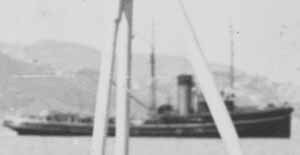 Lt Lewis Bush HKRNVR (late MTB 08) "After surrender of Hong Kong I was acting as Liaison Officer to S.N.O., Aberdeen Naval Base, and having a fair knowledge of Japan and the Japanese language was able to deal quite satisfactorily with the Japanese forces which occupied our area. Some soldiers were burying the dead and as I looked in Joan's (Lewis's dog) trusting and enquiring brown eyes I knew we had to say goodbye. A Chief Petty Officer took her to the back of the building and put a .45 bullet into her head. It was the only way. The Chinese would have eaten her. I dug her grave, my face streaming with tears, wrapped her in a small naval ensign, put her in a beer crate and heaped a mound of stones over her, and at that moment I hated the Japanese more I think than at any time during the war. They seemed doubtful about the wisdom of approaching too close and so I went to meet them and spoke in Japanese. The corporal smiled as if greatly relieved and pointing to his bandaged neck said that he'd been wounded by one of our bullets. About half an hour later a lieutenant arrived who said his name was Suzuki. I conducted him to my senior offer who was then waiting in the base office. Suzuki saluted him and then gave a smart salute before the picture of our King. His chief concern was our arms and ammunition. These had all been collected in one place and put under guard. We suggested that he provide his own men to replace our guards who were not permitted arms; but he replied that he could not spare his men until the next day and would hold me personally responsible until that time. David MacDougall MoI "I was lifted on to the motor boat and there my wound was dressed by the bosun, chiefly by means of a bottle of Dettol which was poured straight into the hole. A rough bandage was affixed and that dressing sufficed without change or care for the next ten days. 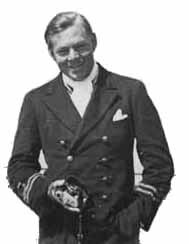 Thirty eight year old CPO Gilbert Thums, a veteran with twenty one years' service in the Royal Navy was Bosun as well as acting 1st Officer of MTB 10 applied his first aid knowledge to the wounded MacDougall. Mike Kendal and Colonel SK Yee had been approached by certain members of the Battle-Box HQ with regards to fleeing the doomed Colony with the escaping MTB party. Kendal informed Gandy that there would be a few extra unofficial bodies with the Chan party. Once again MTB 11 had to be towed in before her engines fired up. 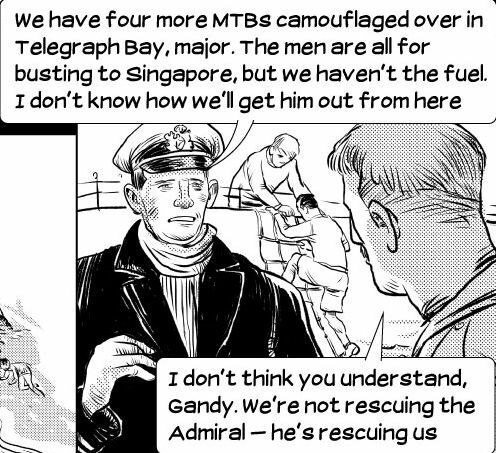 After picking up MacDougall and Ross, Gandy ordered A/B Downey to take Cdr Hsu Heng (Henry) and Yeung Chuen by skiff back to pick up the wounded Admiral. Not finding him where they had left him they returned to Gandy's boat. The brush was still smouldering from the enemy incendiary shell bombardment, with thick acrid smoke shrouding the hill-side. The Admiral had somehow climbed up the slope in the eerie moonlight after hearing the sniper taking pot shots at MacDougall and Ross earlier. Lt-Cmd Yorath and Supt Robinson volunteered to go to the tombolo and search the Isle with Downey. After searching along the rocky coast and whistling they got a response. Adm Chan Chak ROC "A captain and two soldiers of one of the boats came to find me, however it was difficult to tell who’s who in the dark, the captain dared not raised his voice to call for me. I heard the boat docked, followed by footsteps. At the beginning, I thought it was the enemy came searching for us, so I held tight my gun and waited, then I heard someone whistling a tune that only the western people could do. So I copied the tune to respond, then we exchanged several tunes confirming that we were alliance. The Admiral was brought on board MTB 10 just as the remaining MTB's from Telegraph Bay arrived at 21.15. Col S.K. Yee "I put the two others on a junk, asking the fishermen to take them to a hospital on the mainland in Kwangtung Province. After staying in the Harbour Mission Church in San Shi St S.K made his way to Chungking independently via Kukong where he was awarded “Commander of the Most Excellent Order of the British Empire” (CBE) for his part in subverting fifth columnist in the colony. Of the sixteen who set out on "HMS Cornflower's" launch, two were killed, two made their own escape independently, while the remaining twelve made it to the MTB's. They were all provided with dry clothes and enjoyed hot coco and spirits. There was much lively debate on where to make course for. Back in Aberdeen the 150 ton berthing tug Polly AKA C.410 was refloated and Cdr Montague had not one, but two RNR Master Mariners, Lieutants Pethick and Pittendrigh volunteer to join his motley crew. Cdr Montague RN (Ret) SNO Aberdeen "Meanwhile, at Aberdeen, Lieutenant Pittendrigh had succeeded in refloating C.410 and brought her to the dockyard. When the situation was explained to Lieutenant Pittendrigh RNR, Lieutenant Pethick RNR, and messers E. Cox Walker; A. Marchant; C. Skinner and E. H. Brazel volunteered to man C.410 in order to take Admiral Chan and his party to Mirs Bay. Eddie Brazel HKRNVR (C.410) "On our return we were advised that Hong Kong had capitulated, and a senior N. O. (Montague) said that he for one did not intend staying in Hong Kong, as long as there was a seaworthy launch available to make a dash for it. Quite a few of us said we were in complete agreement with his sentiments, and that the launch was at his disposal as long as we could tag along. So a party of seven in all began to prepare the launch for our escape, endeavouring to keep under cover as much as possible, so as not to give ourselves away to Nip. We decided it would be best to wait for cover of darkness before attempting to leave harbour.